Music has always been a passion of mine and I got involved as a kid back in 2002. My main instrument would be the saxophone , and I perform live from time to time. 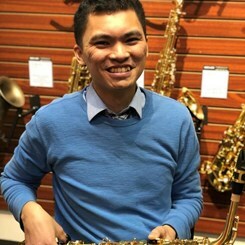 During my high school years I was in marching band and performed on both alto saxophone and bass guitar, which was a great learning curve. The lessons I learned from marching band serves me now since I'm a part of a band and hopefully I can pass on the knowledge to our customers.